The Senate on Monday approved a measure 99-1 to overhaul the international mailing system in an effort to shed the U.S. Postal Service’s reputation as providing a loophole for illicit drug manufacturers abetting the nation’s opioid crisis. Many lawmakers and stakeholders have for years pushed the reform, which would require USPS to receive “advanced electronic data” on the contents of international packages before they reach the United States, but the Synthetics Trafficking and Overdose Prevention (STOP) Act only came up for a vote in the upper chamber after it was included in a package (H.R. 6) of dozens of other measures aimed at tackling the epidemic. Supporters of the measure were hopeful it would help stem the flow of illicit, synthetic opioids from foreign manufacturers through the mail system. While the provisions of the STOP Act remain unchanged from the version the House initially passed in June, other provisions in the larger package have been tweaked, meaning the two chambers must still reconcile their bills before sending it to President Trump for his signature. The legislation would bring requirements currently enforced on private shipping companies to the Postal Service by 2021, when the mailing agency would transmit the advanced electronic data, or AED, to Customs and Border Protection on 100 percent of international packages. USPS, which currently only collects the data on 40 percent of inbound international packages, would have to provide the information on 70 percent of packages by the end of this year. The agency would face civil penalties starting in 2021 if it continues to allow international shipments without AED to enter the country. Most foreign packages would face a $1 fee to cover the costs of additional customs processing. The bill would have far-reaching impacts across the federal government. CBP is responsible for inspecting the packages at USPS’ international mail facilities, though investigations can involve Immigration and Customs Enforcement’s Homeland Security Investigations, the Drug Enforcement Agency, USPS’ Postal Inspection Service and other federal offices. The House bill would require the State Department to negotiate international agreements that require foreign countries to provide AED before sending packages. USPS, CBP and other agencies would be tasked with collaborating to develop new technology to help customs officers better detect illicit drugs in the mail. The agency currently relies primarily on canine teams to find packages containing illicit drugs. Robert Perez, CBP’s executive assistant commissioner for operations support, told Government Executive in an interview last year that front-line personnel rely on analytics based on synthesized information gathered throughout the government’s law enforcement community to better identify what to look for when searching for illegal materials. That is coupled with and updated by CBP’s own observations in the field, as officers adjust to the ever-changing practices adopted by drug traffickers. CBP maintains a presence at international shipping centers operated by both private carriers and the Postal Service, though under a law enacted after 9/11, only the private carriers are currently required to provide AED. That gives customs officers insight into who is sending the packages and allows them to flag questionable content lists based on their knowledge of how the traffickers operate. CBP’s National Targeting Center combs through the data on a daily basis and provides reports back to “advanced targeting teams” in the field, which then further analyze the information and filter it through the trends they see locally to help screeners identify packages for additional scrutiny. Private carriers shipped just 50 million international packages in 2016, however, compared to 600 million shipped via the Postal Service. USPS was, until recently, not providing advanced data at all, and despite some pilot programs requiring the electronic information, still does so in a minority of cases. At international mail facilities, therefore, Perez said CBP officers operate on a “much more manual” basis. The agency asks the Postal Service to segregate mail originating from “countries of interest” and then begins a “manpower-intensive” process, including hand-selecting questionable packages and putting them through x-rays and other technologies frontline personnel employ. The bill is not without its critics, who at hearings over the last two years have said that many countries do not have the capacity to provide the advanced data the bill would require and its passage would effectively shut off the shipping of packages to the United States from those areas. Sen. 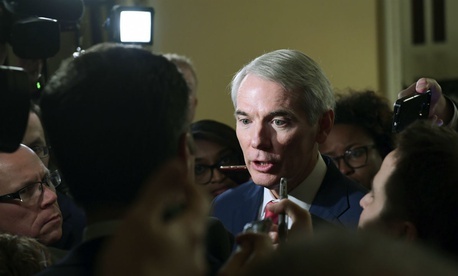 Rob Portman, R-Ohio, who has introduced the measure in consecutive Congresses, noted on the Senate floor last week that fentanyl overdose deaths spiked 850 percent between 2013 and 2017 and action must therefore be taken. He added that fentanyl manufacturers, located primarily in China, specifically target USPS for their shipments. The White House is supportive of the bill. “This bill would improve the security of the international mail system to prevent abuses by those who would use it to smuggle dangerous opioids and other illicit substances into the United States,” the administration said in a statement earlier this year. President Trump laid out his Initiative to Stop Opioid Abuse in March, which included suggestions similar to those in the House-backed bill. The federal government continues to attack the issue from many angles, including efforts to stop the problem at the source. The DEA, for example, has grown its presence in China and is working with its counterparts there to crack down on manufacturers of opioid synthetics that are common in the country. The agency has set up an exchange program of chemists to identify and share emerging trends, as manufacturers are constantly altering the compounds that make up the drugs.